Hello, readers! I am serializing my 9,000 word short story, “Nightfire!”, for a fun way to read a story over six days. On the seventh day, I am going to ask a question about the story, and the first three persons who e-mail me the correct answer will receive a $20 Amazon gift card. “Nightfire!” is a prequel to the novel, Corvette Nightfire, and like the novel, it is full of love, heartbreak, crime, danger and heroism. Have fun with this, and I hope it whets your appetite to read the novel! Slap-slap-slap-slap…the feel of this sound resonated throughout his body, even as a memory of years before. They were running on a level expanse of rocky path high on the mountainside before the trail took yet another descent towards the valley. Rahui took intense pride from the sounds of his huaraches (running sandals) on the rocks and dirt. He was ten years old, and already he could keep up with his mother. They had run for half a day, and he was still with her. They would be done before dark, because the weather was clear, and the crisp spring air refreshed them. His little brother lagged behind. Rahui and his mother stopped from time to time, until he was in view, and then they ran on, pausing again when they could no longer hear the boy, who was two years younger than Rahui. The father was ahead of them by far. Probably, he had just a short way to get to the village of Rahui’s cousins’ family. His father was fast and had been on many winning teams of the rarajipari races, in which the males competed with men from various villages. From past experience, Rahui knew that by the time that he, his mother and brother arrived at his relatives’ cabin, his father would already be feeling the effects of the “tesguino” shared by Rahui’s uncle: The corn beer would have his father talking too much and looking sleepy-eyed. “Watch out for chabochi,” Rahui remembered his mother telling him for the first time on this particular run. The chabochi were the non-Indians, and since the great war had ended three years earlier, in 1945, the chabochi seemed to be encroaching at an alarming rate in the Copper Canyons. Rahui had heard his parents say that all chabochi were evil. They cared only about material things for themselves, and they did not believe in the sharing: the kórima. That would be so sad, Rahui thought. Happiness only comes from the sharing. He remembered thinking about the chabochi a lot on this particular run. Time and again, the chabochi had invaded the formidable canyons of las Barrancas del Cobre, the Copper Canyons, in the state in Mexico which his mother had told him was named “Chihuahua.” The Spanish chabochi had conquered the Indians centuries earlier and had imposed their Catholicism upon the Rarámuri indigenous people. They had proclaimed a loving and compassionate son of a god who would save them, apparently in exchange for the land that the Rarámuri inhabited. The indigenous people had adapted the new beliefs into their own cosmology. These days, his mother had explained, the chabochi coming in were Mexicans who were claiming the resources of their land as their own. Some were especially bad people who were growing marijuana and poppy in the mountains. “They have brought us a language that they want us to learn. They make us use words for which we have no letters. They are confused people. They name us in Spanish but use our Rarámuri names for places. They do not even call our people correctly. We are the Rarámuri, the running people, but the Mexicans and the outside world call us the Tarahumara. They are confusing even us. Our own people are naming their children with Spanish names. In Spanish, your name, my son, is Día,” his mother told him. He had to learn how to pronounce that because there was no letter “d” in his language. The Rarámuri had a pretty, lazy language that rolled with many colorful “r” sounds. Día was the word for “day.” When Rahui first saw Luna, he connected the meaning of his name to the sun. The Rarámuri believed that the Father-God was the sun. The moon represented the Female-God. He was struck by a lightning bolt of love the moment in which he first saw Luna. He pointed to her when the families were arriving at the meeting place on this particular trip and asked his mother who she was. “Her family is friends with your cousins,” she answered. “The girl’s name is Luna. She is called by that Spanish name. It means, ‘Moon.’ She is a beautiful child. She casts glances at you, Rahui.” His mother laughed, expecting that he would be embarrassed. If his mother had examined his face at that moment, she might have seen the nascent glow of comprehension in Día’s eyes: he was staring at Luna and instructing his destiny to steal her. That year his father’s team won the rarajipari race that lasted two days. The men bulked up on the corn beer and slept at intervals the day before the race, while the women cooked. The women’s race started when the men’s race began, but theirs lasted only a day. Their race day was merry and full of conversation and giggles among the teams. The men were intense because their race was important. The running was the primary distinction of life for the Rarámuri. It marked their identity. It was their means of communicating among their people so sparsely dispersed throughout the forbidding canyons, mountains, and hills. The running Rarámuri carried the Word. Along the path to the village that hosted the finish line of the men’s race, people set up torches to mark the way for the nighttime running. Each team of men kicked a wooden ball the entire route of the race. Día’s father finished first. He walked to a tree stump and sat, and young boys came up to him and began to massage his legs and feet. The previous day, the team of Día’s mother also had won the women’s race. So this was the special time that Día remembered until the day that he died: He was old enough to understand his coming manhood. He witnessed the triumph of his parents in their prime. He saw Luna for the first time, and he stole her heart by showing her the look in his eyes. As she told him this, Día felt a stir of cognition in his soul, portending a dark destiny: Luna would be his light, and the chabochi were to be his night. His mother’s admonishment when he was ten years old left him feeling privately terrified. He grew up looking more chabochi than indigenous. When he married seventeen-year-old Luna at age nineteen, Día was strong and filled out, not skinny like many of his Rarámuri friends. He liked to wear his hair long and straight. In a few years he wore a mustache. His mother told him that, at some time, one of his Rarámuri ancestors must have married a Mexican with Spanish ancestry. He didn’t have European features like a Spaniard, but he was tall like some of the men from the north of Spain and like many of the gringos whom they had seen. As Día matured, his body and appearance grew to reflect the influences of the outside world of Chihuahua, in Mexico, and of Texas and New Mexico in the United States. It was because he got bit by the chabochi and traveled their paths. Luna clung to him and went everywhere he went. 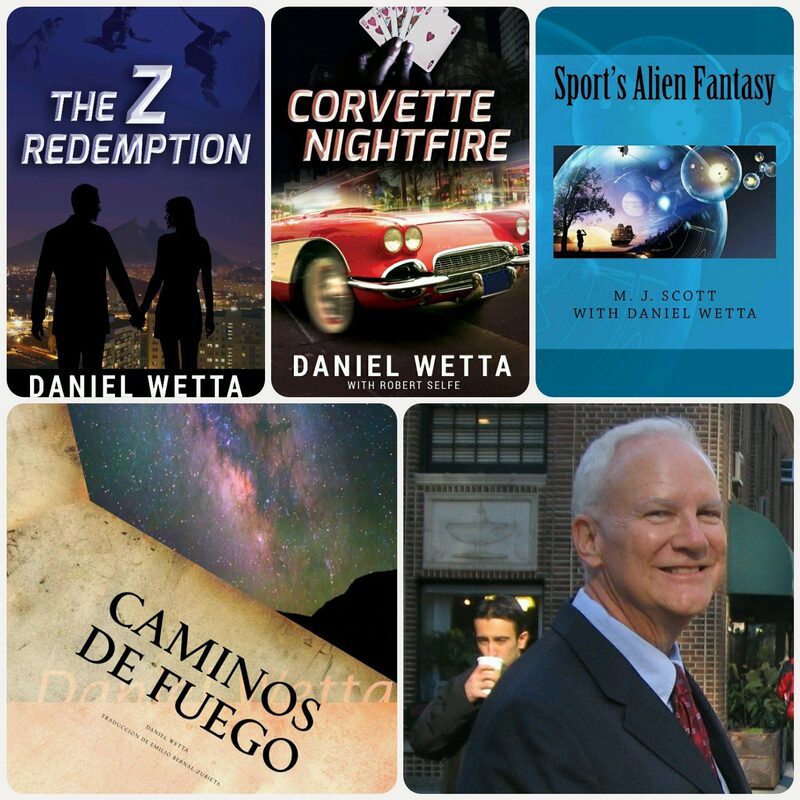 If you enjoy the story, I think you would love Corvette Nightfire! Rated 4.8 stars on Amazon and 4.3 stars on Goodreads, the e-book novel is only $2.99.